22 killed in Israeli airstrikes on Syrian base, observer group claims. At least 9 of the dead are Iranian soldiers. At least 22 people were killed Sunday evening in an airstrike attributed to Israel, Arab media outlets claimed Monday. On Sunday, explosions were reported outside of the northern Syrian city of Aleppo. According to SANA, the Syrian state-run media outlet, the Al-Nirab airbase was attacked by Israeli forces. "The Zionist enemy continues to desperately support the defeated terrorists in Quneitra and ISIS, and fired a missile toward one of our military sites,” claimed SANA. The Syrian officer quoted by the SANA report claimed that the base had suffered damage, but that there had been no casualties. Opposition sources said that at least 10 missiles were fired at the airbase, which has been used by Iran’s Revolutionary Guard in the past. On Monday, the Syrian Observatory for Human Rights claimed that nine soldiers had been killed in the airstrikes Monday. The dead included six Syrian soldiers, the remainder being foreign pro-Assad regime fighters – most likely Iranians. The SOHR report claimed that Iranian forces had been stationed at Al-Nirab at the time of the attack. Later reports from Arab media outlets raised the death toll from 9 to 22, including 9 Iranian soldiers. 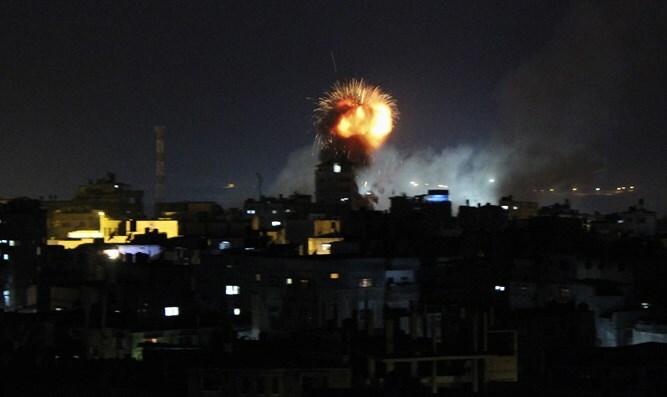 The Israeli military has not confirmed whether it was responsible for the strikes on Al-Nirab.